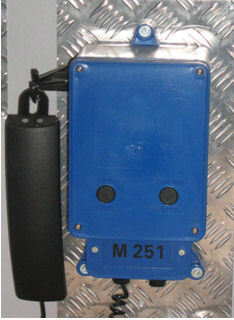 Enclosure:	Case and Handset, High impact ABS thermoplastic. V2 Flame retardant optional. Ring Tone:	Shrill tone, 2k9 Hz through electronic sounder. Loudness 105 dBa/30cm Sensitivity. Down to 35v AC rms 15 � 25 Hz. Standards:	Approved to S.A. Telkom std. TE/001. Single I/C for speech and dialling.